Attention shoppers, wine geeks, or anyone who just wants to know more about what the heck they like in a wine (why should geeks have all fun? ): at the upcoming Lodi Wine & Art Auction eighteen wineries will present, for your sensory and intellectual pleasure, over twenty barrels of 2008 or 2009 Zinfandels representing single vineyards, as well as the influences of growing conditions associated with the seven official sub-appellations (i.e. AVAs) of Lodi. You, too, can experience the sense of terroir that growers in this historic region – many of them belonging to families who have worked the land for over 100 years – have long known and spoken about, hitherto mostly among themselves. Isn't that the essence of what our finest wines are all about? What is in a name, be it a Zinfandel from Lodi or a Cabernet from Oakville: would not what we call a rose by any other name smell as sweet? Terroir is one of those wine terms that most people, even wine professionals and so-called "experts," have trouble tasting in wine; and so the most convenient thing for many of them to do is to deny it exists. In certain places. That terroir is part and parcel of wines from France, for instance, is never questioned by the cognoscente. Fine French wines – the sort qualifying for specific Appellation d'origine labels (not the mass production French wines) – invariably do have a strong "sense of place," which is essentially what terroir means: sensory qualities, including aromas and flavors, that can be attributed directly to where a wine is grown (soil and topography, climate and grapes utilized, and even the human influences associated with viticultural and vinification practices of a given place of origin). In the U.S., it is branding, winemaking styles and approaches to grape growing, and commonly, "varietal definition" (since we tend to place more value on how well a wine ascribes to preconceived notions on how a wine grape should taste – something that Europeans, frankly, could give less of a damn about) that tends to obfuscate sensations relatable to terroir. But sometimes, we all know, you can’t quite tell a stranger about rock ‘n roll. You don't need to know exactly how to explicate terroir to know its meaning and that it is there. 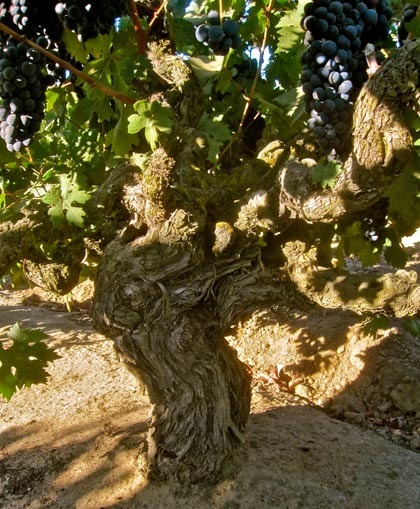 Fact is, as in France and other great wine regions of the world, the best American wines are grown in vineyards where there is ideal soil, topography, special climates and grapes chosen to grow there. They don't come out of a box. Terroir exists, in premium American wines like Lodi zins, whether you can perceive it or not. And when you find it (ah, those moments of epiphany), it sure is fun! 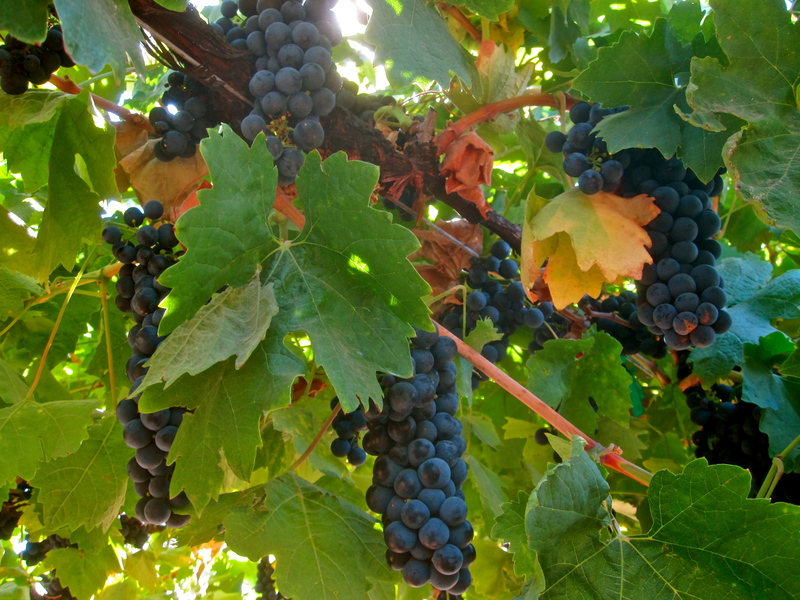 Old vine zinfandel from the famed Soucie Vineyard (planted in 1916) on Mokelumne's "left bank"
Lucas Winery: from one of Lodi's first "small wineries," both a 2009 barrel and (with dinner) a vertical of their ZinStar – David Lucas' organically farmed, head pruned, 3.5 acre planting, located on the "left bank" of Lodi's historic Mokelumne River sub-region. Michael-David Winery: from Lodi's most internationally esteemed grower/producer – no less than three of their single vineyard Zinfandels from the Jahant, Clements Hills and Borden Ranch sub-regions of Lodi. 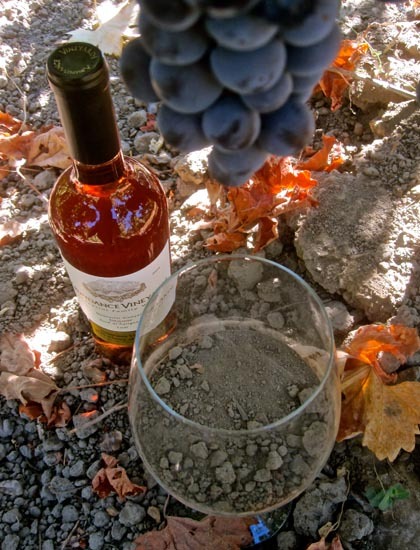 Klinker Brick Winery: single vineyard old vine zin from the "right bank" of the historic Mokelumne River, farmed by fifth generation winemaker/owners, Steve and Lori Felten. M2 Wines: by mavericky, handcraft winemaker/proprietor Layne Montgomery, a 2009 barrel representing the famed Soucie Vineyard, on the "left bank" of the Mokelumne River, at its coolest, westernmost edge along the Delta. Ripken Vineyards & Winery: grown by longtime North Coast grower and rootstock king, Richard "Rip" Ripken, a single vineyard Primitivo (the Zinfandel that is "not" Zinfandel) from the "right bank" of the Mokelumne River. Heritage Oak Winery: barrel of Zinfandel from Hoffman Block 14 located on the "left bank" of Mokelumne River; grown by proprietor Tom Hoffman, whose family has been farming in this part of Lodi since the 1860s. Barsetti Vineyards: barrel of 2008 zin from a vineyard off Ray Rd. (the Mokelumne’s “left bank," if you will), made by proprietors Richard Gray and Janis Barsetti Gray. Other wineries presenting barrel tastings and wine for dinner: Abundance Vineyards; d’Art Wines; Delicato Family Vineyards; Harmony Wynelands; Jesse's Grove Winery; Lange Twins Winery & Vineyards; Macchia Wines; Peirano Estate Vineyards; Spenker Winery; Van Ruiten Family Winery; Vicarmont Vineyards & Winery; Watts Winery… and more to be announced. Sure this is a black tie affair, and if you can’t find a partner grab a wooden chair. 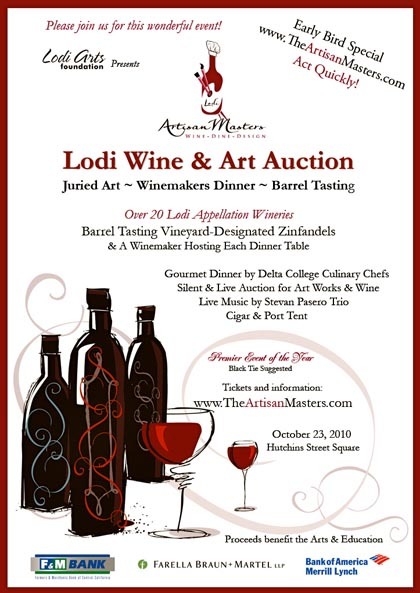 But you can bank on an incredible sensory experience of terroir and Zinfandel at Artisan Masters' Lodi Wine & Art Auction!